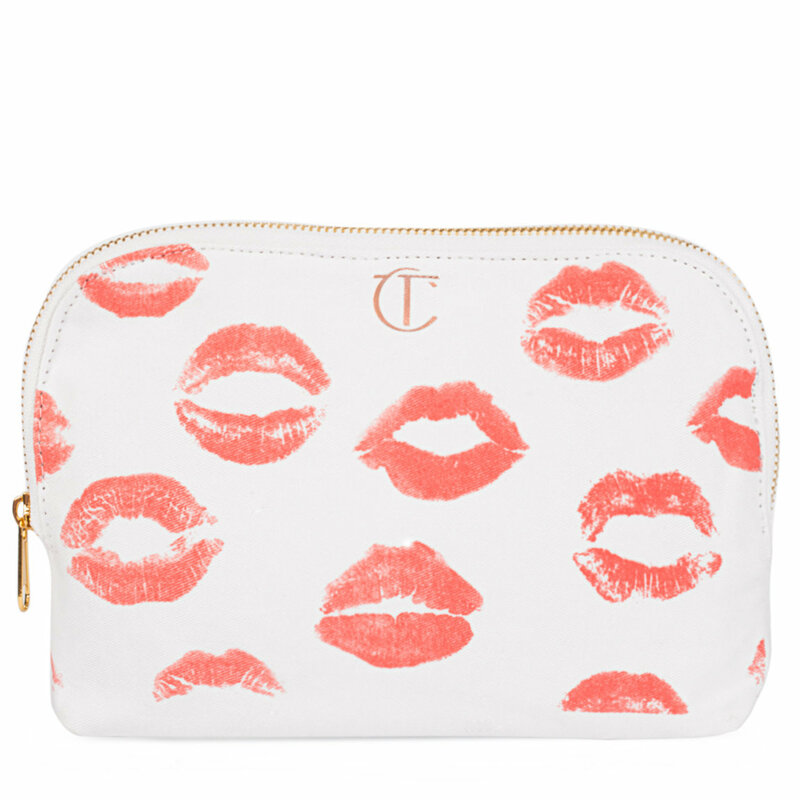 The Charlotte Tilbury Makeup Bag is a cotton canvas makeup bag printed with the fabulous lip prints of some of the most iconic women in fashion. It's the perfect size for holding all your makeup when you're on the go! The bag has a gold zip, black lining and is machine washable. Okay it was definitely way bigger than I was expecting it to be. But man do I love it, it fits full size brushes and whatever product I need to put in be it full size or travel/mini size. I really love the lipstick kisses on it too, that's probably the main reason I bought it because of how unique that is versus any other makeup bag I could've gotten. This is one of my fave things I use for travel! II think it's so cute and actually fits quite a lot in it. I can tend to over pack when it comes to makeup but this is perfect for a long weekend trip because it helps me stream line at the same time as fitting everything I need! I love that each lip is a celebrity lip print too! So clever! My second bag - it holds so much beauty stash; great for traveling! This is my second Charlotte Tilbury cosmetic bag so that says a lot. I use one for travel that is ready to go and another for daily use. It holds enough product for cleansing and make-up application. <3 this bag and you will too! The print is lovely! As cute as the bag is, it's just barely big enough for travel. For a weekend getaway. Definitely not big enough for a week or more, especially if I'm going to be in the Caribbean requiring at least 2 foundation for when I get darker and such. Also the fabric is a bit thin, so I worry it may rip in my suitcase. If you're using this for a big purse makeup bag, this would be perfect, or if you're a light makeup packer. I on the other hand am not, and like options. But the bag is very cute and would make for a nice gift! So Cute! So Roomie! So Perfect! It really is a great size. Fits all the necessities and even more. I just love the pattern and the quote on the back. It is the best girlie makeup bag for any girlie girl in your life. I'll definitely be using mine for a long time to come. I was in need of a new makeup bag for my purse, and thought this would be perfect! I love the pattern and style of the bag, though since it is cloth, it does tend to get and show when it gets dirty from the rough and tumbles of inside my bag. A plus though, I love that the zipper goes all the way around and its incredibly spacious; makes it great for travel and just putting whatever you want in there! I love how spacious it is! I can fit both of my Instant Look In A Palette and even the Instant Eye Palette inside, and I'm loving how easily it goes into all of my bags. Definitely bringing this for travelling and I'm planning to get another one! This bag really fulfills my make up storage needs! Its a good size to fit most of my make up needed throughout my day and doesn't take up much space in my bag. To top it off the design is really cute and simple. Love!! The bag is the perfect size! I'm so glad I made my purchase and chose this one. So cute!